Step the legs apart then turn one leg 90 degrees out and bend this knee. Position the knee above the ankle. Stretch the arm on that side up so that the side of the body is stretched. Lean back and place the other hand on the straightened leg and look up. Placing the hand on the leg for some extra support can help relieve pressure form the back. It is challenging to get the back foot flat on the mat. The more the knee is bent the more challenging this becomes. A lot of energy and force up through the body becomes lost when the back foot is not flat on the mat. To prevent this take the legs closer together. The endurance of the pose will also increase when this is done. This is a nice stretch to perform before Parsvakonasana. If this is done both sides of the body become stretched. Both legs are strengthened in this pose. It can also help the knee muscles strengthen. The shoulders are stretched and the arms are strengthened. This yoga posture will also increase groin flexibility. Muscles involved in the external hip rotation in the back leg are the quadratus femoris, gemellus superior and inferior, obturator internus and externus and the piriformis, they are all strengthened. When they are used the inner leg muscles in the back leg become stretched. They are the pectineus, adductor brevis, adductor magnus, gracilis tendon of the psoas major and further up the pelvis the iliacus on the outer part. 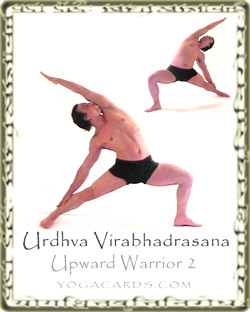 The adductors in the leg get a deeper stretch than in Virabhadrasana 2.